Granby – Granby Elementary School, 7101 Newport Ave. Ocean View School – Ocean View Elementary School, 9501 Mason Creek Rd. Northside – Therapeutic Recreation Center, 180 E. Evans St.
Titustown – Titustown Recreation Center, 7545 Diven St.
Zion Grace – Zion Grace United Methodist Church, 1440 W. Little Creek Rd. According to the city’s website, there are 12,339 registered voters in this ward. Expect turnout to be extremely light – so every vote counts. In case you missed it, this seat became available when Andy Protogyrou ran unsuccessfully for mayor. Council appointed a temporary replacement after setting the date for the election. I’m not too crazy about this special election being held in August, especially since candidates only had 5 days to get their paperwork done. 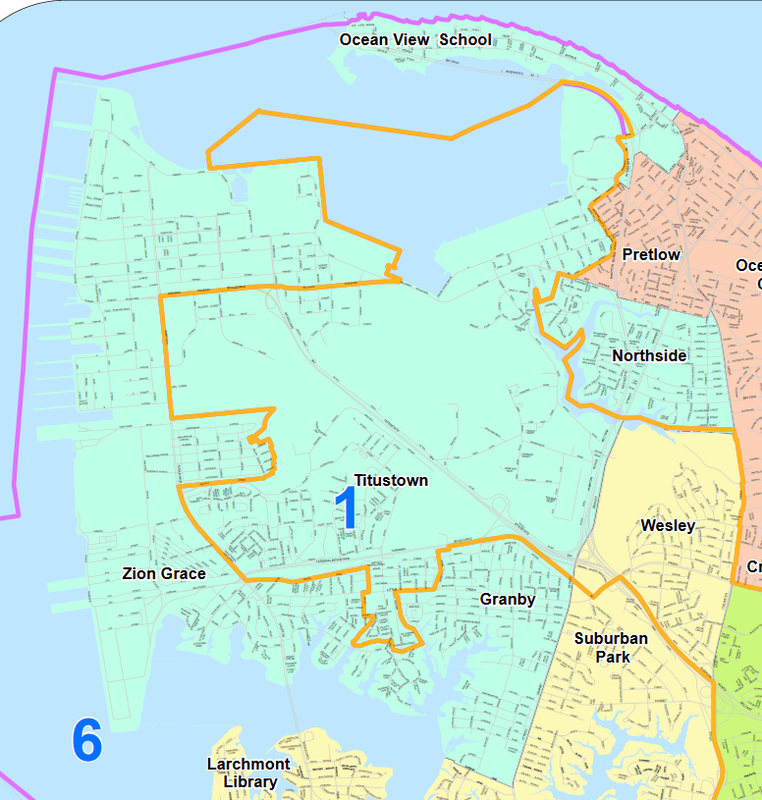 Norfolk really needs to pursue a charter change that allows for the special election to be held the same day as the regular election (like Hampton) when a candidate is required to give up his/her seat to pursue a different office (the so-called Herb Collins rule). Part of leadership is foreseeing what can happen: that a special election would be necessary was known last October, when Protogyrou announced that he was running for mayor. Somebody should have had the foresight to ask for a charter change during this past winter’s General Assembly session. With an emergency clause, it could have been effective for the May election. Barring that, the election should have been held in November. I’ve no doubt Thomas will serve the city well. But that’s not the point. Candidates should have time to prepare because voters deserve a choice. Anyone have dollar cost per vote on the :”special” election? The young lady appointed to the council was a great addition. She was highly qualified and I am sure could have been asked to serve to November 8. Oh well who, wants a no cost election when u can spend approx. $30,000 taxpayer dollars on a special election anyway? The cost was estimated at $30,000. There were 746 votes cast. So that’s $40.21 per vote – pretty costly if you ask me.